Q: How do I change my watch or handheld GPS for Daylight Savings Time? Q: How do I turn my GPS watch on and off? Q: What are the iGolf abbreviations for hazards? 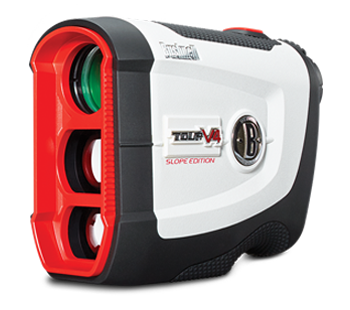 Q: How do I reset Jolt or Yards on my Tour V3 or Tour V3 Slope? to cycle through the 4 available modes. When your desired mode is shown in the eyepiece display, release the POWER/FIRE button to select it. If you did not select the correct mode. Wait for the unit to power down and repeat step 2. Q: My Neo Ghost shuts off every 15 minutes, how do I disable the auto-off function? - Navigate to the settings screen by pressing the “MENU” button - Use the up or down button to select “SETTINGS” - Press the “SELECT” button to confirm. - Press the “SELECT” button to confirm setting. - Use the up or down button to select “SETTINGS” - Press the “SELECT” button to confirm. - Press the “SELECT” button to confirm. - Use the up or down button to highlight and select “ON” - Press the “SELECT” button to confirm setting. Q: The website says my serial number is invalid. There are several reasons that a serial number may not be recognized during registration. To determine the source of the problem and have it resolved, contact iGolf technical support via live chat at https://www.igolf.com/ft_techSupport. Q: My unit does not auto advance when I move to the next hole. This is usually caused by an inaccurate map of the course being stored in the device. Downloading the latest version of the course map should fix this problem. You can press the “Up” or “Down” arrow to manually advance the hole if this happens. Q: Can the battery in my GPS Watch be changed? Under the vast majority of circumstances, the batteries used in our GPS Watches will provide years of trouble free use, and will not need to be changed. The warranty on the GPS watch will be void if the consumer tries to change the battery. If you feel that your battery is going bad, please contact Bushnell Customer Service at customersupport@bushnell.com. Q: My Neo+ Watch won’t charge. Because the charging contacts on the Neo + watch are against your skin when it is worn, the contacts can get dirty and simply need to be cleaned. This can be done by spraying ammonia based glass cleaner (such as Windex) on to the contacts and then scrubbing with a nylon brush (such as a toothbrush.) Wipe the contacts with a paper towel and the watch should charge. The Neo + watch can’t charge while it shows the battery meter, so it needs to be showing its main watch face before it is hooked up to charge. Simply press the ‘Menu’ button repeatedly until the time and date show on the watch, and then reconnect the charging cable. Q: I forgot my Bushnell.iGolf.com password? Please click on the Forgot Password link in the Bushnell.iGolf.com website footer. Login to your Bushnell.iGolf.com account and go to your profile page. Click on the EDIT button to change or update your account information. Q: How do I register my Bushnell Legacy GPS rangefinder? 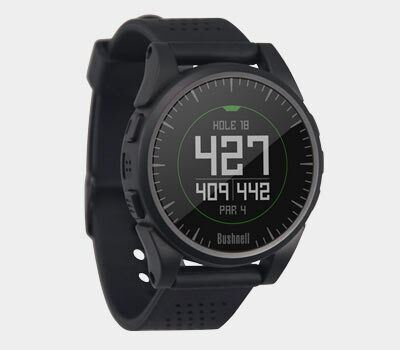 Go to bushnell.igolf.com to register GPS device which will update the preloaded GPS course data and load any new courses that have been recently added to the iGolf database. Registration is free and will only take a few minutes. 2. 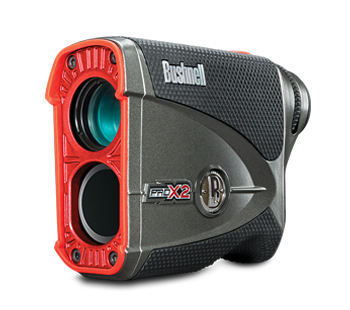 Go to http://www.bushnell.iGolf.com, select ‘Register Now’, enter the requested information and select the ‘Continue’ button to continue. 3. Follow the instructions on screen to install the device driver and browser plugin that allow your device to communicate with iGolf. 4. The final device setup page allows you to update all of the preloaded courses on your device, to ensure that you have the latest possible information on all courses. Press the “Sync Device” button, and wait for the process to finish. Once your GPS rangefinder has been registered, you may have occasions in the future when you want to update the GPS data for an existing course, or download a brand new course. This can be done easily at anytime. 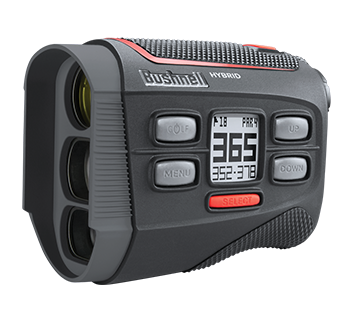 First make sure your GPS rangefinder is connected to the computer and that you are logged in to your bushnell.iGolf.com account. Then, simply click the ‘Device Setup’ button, then the ‘Sync Device’ button-this will download all updated and new course data to your GPS+ rangefinder. Q: Can I download international courses? Your GPS device is preloaded with international courses. However if you find your device does not have an international course you are looking for you can download the updated course at bushnell.iGolf.com. Q: Why do I need a membership? You are provided a free membership to Bushnell.iGolf.com. You need this to sync/register your device, download new courses and receive software updates. Note - You are not required to log into bushnell.iGolf.com after you register your device for the first time. You will always have access to the courses on your device and new courses from bushnell.iGolf.com. To perform a full sync connect your device to the computer, log in to bushnell.iGolf.com and visit the "Device Setup" page. Select the "Sync Device" button and all front, center, back and custom point data will be updated on your device. The full sync should only take a few minutes depending on how many files need to be updated. 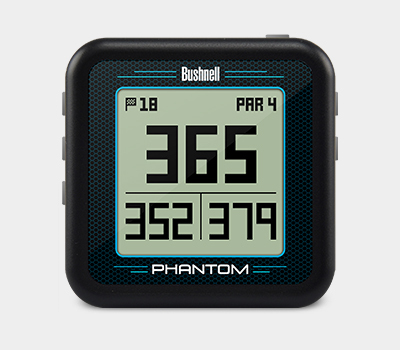 Q: How do I locate and manually download a golf course from bushnell.iGolf.com? 4. Select your course from the list of possible matches below the search bar, clicking on the name of the course in the list. 5. Once the detailed information about the course loads to the screen, make sure your device is plugged in to your computer via the provided USB cable. It’s best to plug the device directly to the computer, rather than through a USB hub, keyboard, or printer peripheral. 6. Click on the “Download GPS Course File” button. 7. Once the screen says ‘Sync Complete,’ your course has been downloaded. Bushnell.igolf.com is Mac compatible, though there are occasional problems with the Safari browser that comes standard with Mac operating systems. Other free internet browsers such as Mozilla Firefox or Google Chrome for Mac can be used instead of Safari to avoid these problems if they occur. Front/Center/Back: If this state’s Available it will have the measurements for the front/center/back of the green. This information is pre-loaded. Custom Points: If this state’s Available it will have the measurements for the Hazards on the golf course. This information is pre-loaded. Course Image: If this state’s Available it will have the golf course image for each individual green. This information is not pre-loaded. Q: How can I modify GPS points during a round of golf? During play, if you wish to modify a GPS point, the Neo+ and Hybrid were designed to easily allow the user to customize the golf course file to their preference. While in Play Golf mode, press ESC button to access the Play Menu. Select ‘Map Golf Hole’, highlight to point you would like to modify and press OK button. Go to the location selected and press OK button. Once the point has registered, highlight the save button and press OK. Repeat for other points if desired. Q: My GPS handheld/watch is displaying 999, what does that mean? There are a few reasons the GPS will display 999. Q: Change Device in Profile. 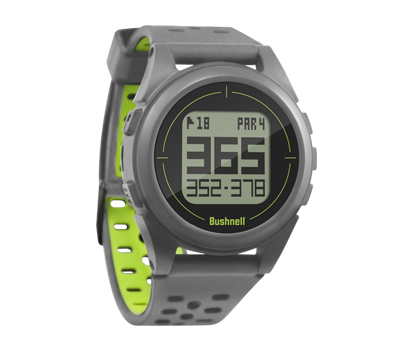 The files downloaded from Bushnell.iGolf.com are specific to the device registered in your Member Profile, and only one device can be registered at a time to a given account. 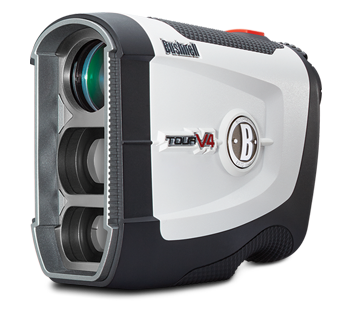 If you use more than one Bushnell/iGolf compatible product, you will need separate accounts for each product. If you have simply upgraded to a new Bushnell/iGolf product, you can contact iGolf via Live Chat online at https://www.igolf.com/ft_techSupport. These warranties do not cover consumer-caused damages such as misuse, abuse or repairs attempted by someone other than our authorized technicians. *Notice: Due to U.S. import and export laws, repairs originating outside of the U.S. cannot be shipped to the U.S. service center. Please contact the nearest subsidiary office that serves your area for shipping information. 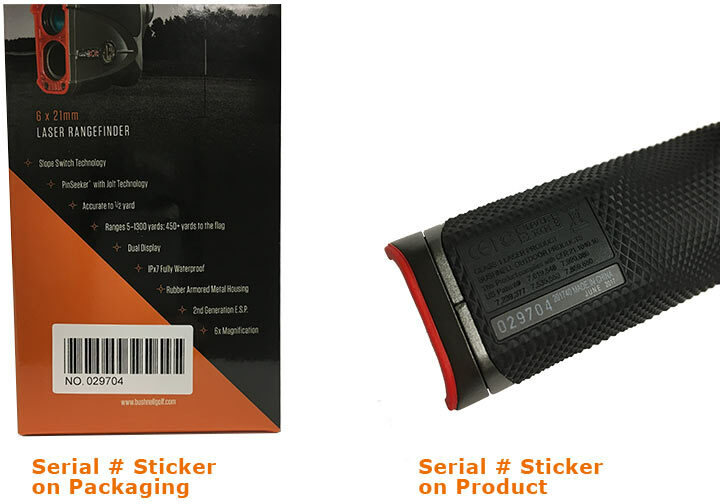 ** Notice: Your Bushnell Golf Laser Rangefinder should have a sticker with serial number on the outer package and on the product (see below). These serial numbers are used to ensure you are purchasing the unit from an authorized dealer. If you are unable to locate this sticker or if the serial number has been obscured, the product may not be authentic (counterfeit) or it may not have been purchased through an authorized dealer. In either case, Bushnell will not honor warranties on these products. You should return the unit to the seller for a refund, and purchase your rangefinder from an alternate location.